Mirimar Cruises has been taking visitors on the most scenic cruise along the Brisbane River to Lone Pine Koala Sanctuary. Mirimar Cruises has been operating for over 60 years and is one of those “must do” experiences while in Brisbane. Mirimar Cruises offers two different tours. The Koala and River Cruise - the famous and iconic half day tour which includes a world class commentary while traveling through the city’s most historic landscapes and historical home sites and the Koala Express - a quicker trip on a faster boat for those visitors that have less time to spend on a day tour. Looking for a cruise experience that is uniquely Australian? Climb aboard the brand new Mirimar II for an Australian adventure, like no other. A Koala and River Cruise is the perfect way to get up close and personal with Australia’s cuddliest creatures while enjoying the sights and sounds of Brisbane’s most attractive waterfront suburbs that are only accessible by boat. This popular journey has been taking visitors to Lone Pine for over 60 years and is a "must do" experience while in Brisbane. See breathtaking modern mansions and historic Queenslander homes. Listen to an entertaining narrated journey, the captain will amaze you with his local knowledge. Sample delicious freshly made Queensland food prepared from their ultra modern cruise boat, and of course, cuddle a koala! 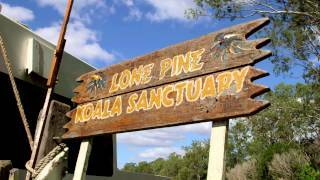 The Koala Express is their express boat to the Lone Pine Koala Sanctuary. Join them on this fun ride on the Brisbane River, through the city's most historic landscapes, iconic attractions, historical home sites and interesting wildlife habitats. Only 40 minutes on the river to Lone Pine Koala Sanctuary. The captain will point out iconic places along the river and slow down for photo opportunities. Just over two hours to explore Lone Pine Koala Sanctuary. See over 130 koalas up close, hand feed kangaroos and see many other Australian Native Animals.